Story: Filmmaker and Academy Award-nominated screenwriter Paul Weitz ("About a Boy") turns his complex sense of humor on Synergy, an insightful comedy about the relationship between a 50-year-old businessman and his new, 26-year-old boss. Dan Foreman (Quaid) is headed for a shakeup. He is demoted from head of ad sales for a major magazine when the company he works for is acquired in a corporate takeover. 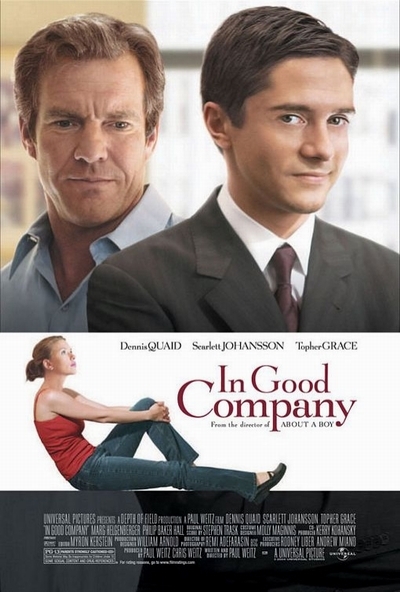 His new boss, Tom (Grace) is half his age - a business school prodigy who preaches corporate Synergy. While Dan develops clients through handshake deals and relationships, Tom cross-promotes the magazine with the cell phone division and "Krispity Krunch," an indeterminate snack food under the same corporate umbrella. Both men are going through turmoil at home. Dan has two daughters--Alex, age 18, and Jana, age 16 - and is shocked when his wife tells him she's pregnant with a new child. Between college tuition, the mortgage and a new baby, Dan can't afford to lose his job in the wave of corporate layoffs. Tom, in the meanwhile, is dumped by his wife of seven months just as he gets his promotion. Dan and Tom's uneasy friendship is thrown into jeopardy when Tom falls for, and begins an affair with, Dan's daughter Alex (Johansson). Weitz's examination of life's surprises, ironies and coincidences combine to form Synergy.